This is Lorraine & Owen Bartlett Lashley who grow vegetables upon an allotment in Goodmayes, Ilford, and come up on the bus each Saturday to sell their surplus under the awning outside Leila’s Shop in Calvert Avenue, where you will find them tomorrow morning behind a small table laden with some of the freshest produce you could buy in London. There is a special quality to vegetables that have been grown by a smallholder and picked that day, which transcends any other produce you could buy. And, each Saturday morning, the table under the awning is a wonder to behold with piles of glistening green spinach, perfect specimens of beans and fragrant bunches of herbs, all proudly arranged. 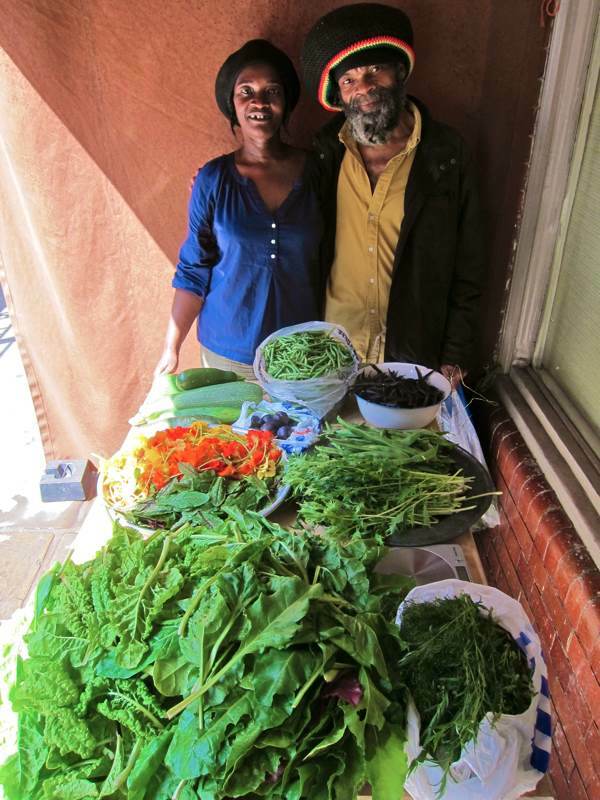 Lorraine & Owen are eager to show off their horticultural achievements and, with so few places to buy fresh vegetables around Spitalfields and Shoreditch, their weekly stall is especially welcome. Originally from Barbados, Owen came to London in the nineteen sixties and Lorraine joined him in the seventies. The couple share a life-long enthusiasm for growing vegetables, which they have pursued zealously even in the most unpromising of urban environments and, recently, Lorraine told me the story of their life together in horticulture while Owen made up bunches of herbs, tying each one elegantly with a piece of vine. 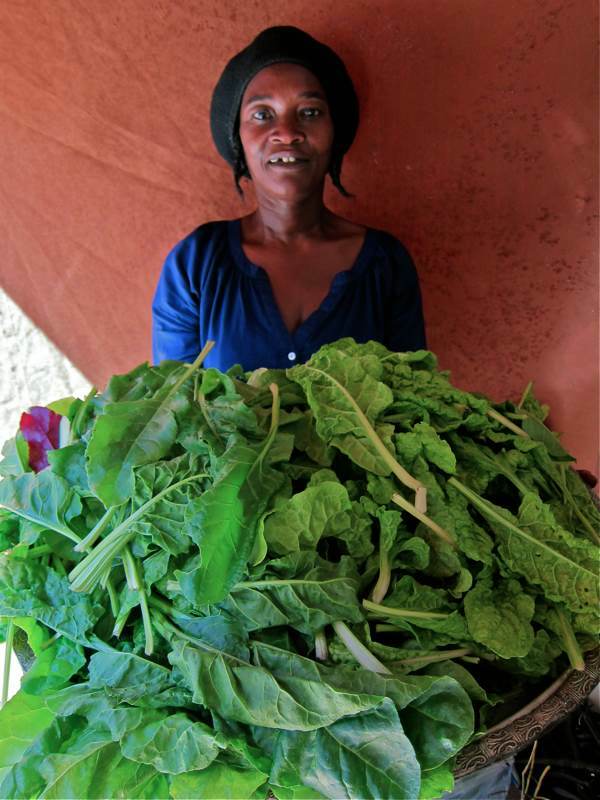 “Before we came to this country we were both farmers, I lived on an estate of five acres and we grew vegetables to feed ourselves and sell locally. I’ve been here thirty-four years now, since Owen came back to Barbados in 1978 and we got married. When I first came to Britain, Owen was studying at Manchester University and I was a youth worker. 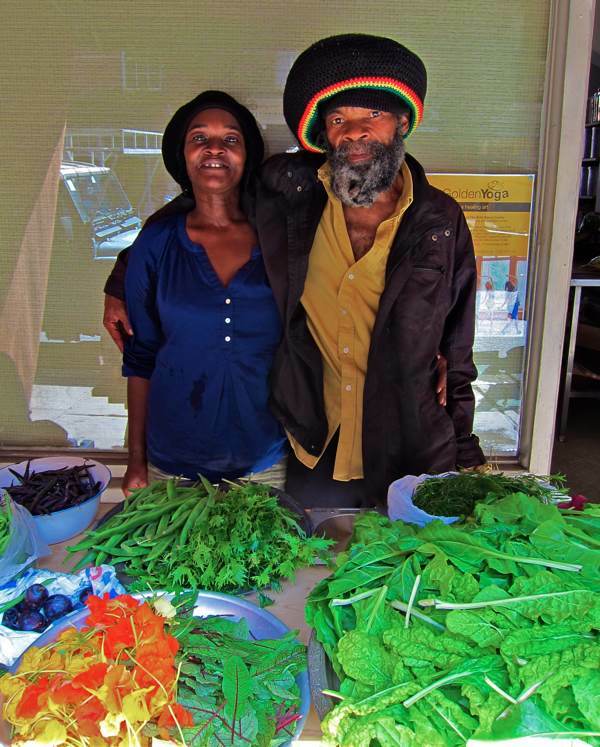 We searched for a plot of land where we could grow vegetables as we had done in Barbados, but we couldn’t find one so we used the long garden that we had and grew organic vegetables there. We had some of the biggest veg you could imagine, marrows, carrots, beetroots and cabbages. We grew everything naturally, without putting any chemicals on the soil. When we moved down to London in 2003, we were searching to find where to grow vegetables and a friend of ours told us about an allotment at Seven Kings that needed people, so we got one plot and then another and we ended up with four plots. It took a lot of work to get the land into condition. No-one had grown anything there for fifteen years and people had dumped broken beds and toilets on it, so we had to do a proper clear out and build the soil up again with a lot of compost and manure and comfrey. We ended up with more vegetables than we could eat or give away. We feed ourselves from our allotment. We only buy oil, flour and rice. We would like to pass on our skills to the younger generation and teach children to understand of the fundamentals of how we eat and farm – and how to do it in a way that’s good for the environment. We plant marigolds among our vegetables that attract butterflies and drive away pests. We don’t use sprays, we pick off insects one by one with our fingers. This week we have brought nasturtiums, green beans, purple beans, runner beans, mazuma oriental greens, bull’s blood sorrel, chard, spinach, beet leaf spinach, courgettes and herb bunches. We come up on the bus from Ilford which is free for us because we both have freedom passes, and it takes about two hours. I get up at five and I pick the vegetables at seven, then we are on the bus by nine-thirty and here around eleven. The first week was brilliant, we took fifty pounds which is enough to pay for the vegetables to plant for next year’s plots. Tomorrow, Lorraine & Owen will be out at dawn to pick the choicest vegetables from their allotment in Ilford and then they will bring them up on the bus to arrange them on the small table under the awning outside Leila’s Shop in Calvert Avenue as usual. So, if you wish to enjoy the privilege of London’s freshest produce, you know where to look. Lorraine shows off her spinach and chard which she picked that morning. Owen offers one of his sweet-smelling bunches of home-grown herbs. They look wonderful. The very next best thing to growing-your-own. What a lovely story to begin the day with. An ‘inspirational’ story – with shining photographs. it’s lovely to think of reestablishing your island home across the sea in blighty, via beautiful vegetables. 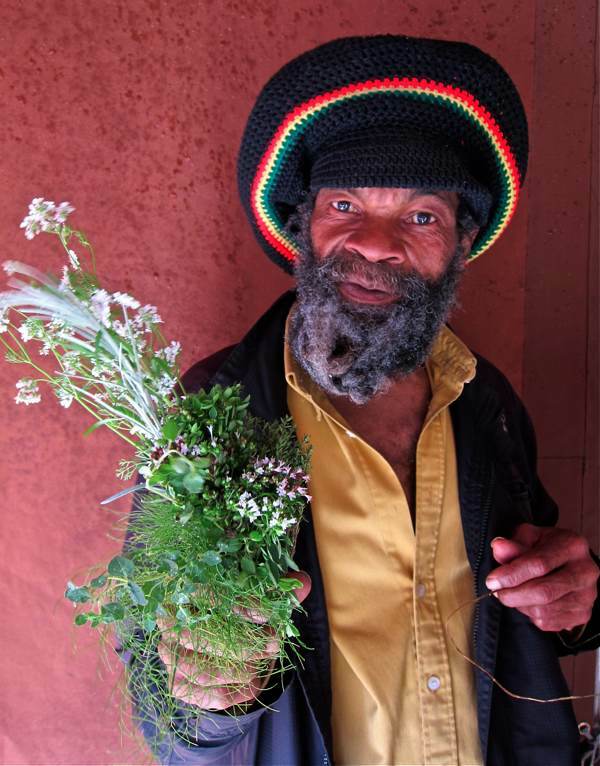 i wonder what some barbadian/brit recipes are that the lashleys cook with their herbs and veg? Everything looks fresh, healthy and lush. Looking good! I am very proud of your achievement and hard work. The alloment and vegetables prove that your love and dedication for the land and good health of your fellow citizen is unmeasureable. I wish you good health, wealth and prosperity as you continue the good work. SHOUT OUT & KUDOS From all of us.